Sealyham Terrier was the creation of retired Army officer John Edwards of Sealy Ham, Haverfordwest, Wales, in the mid- to late 1800s. Edwards wanted a bold, game little terrier who could dispatch the badgers and otters found in the region. Unfortunately, records were not kept as to the breed’s ancestry; Edwards was more concerned with the dogs’ abilities to hunt. The Sealyham Terriers are small terriers and stand about 10.5 inches tall and weigh 20 to 24 pounds. The head is long and broad, the eyes are mediumsized and very dark, and the ears are folded. The body is strong, the chest deep, and the tail docked. The undercoat is dense and the outer coat is hard and wiry. The dogs are white but may have lemon, tan, or badger markings on the head. The coat needs twice weekly brushing to keep it clean and to prevent tangles and mats. The hair needs trimming every six to eight weeks. Show dogs must be hand-stripped, while most Sealyham Terrier owners have their dogs clipped. 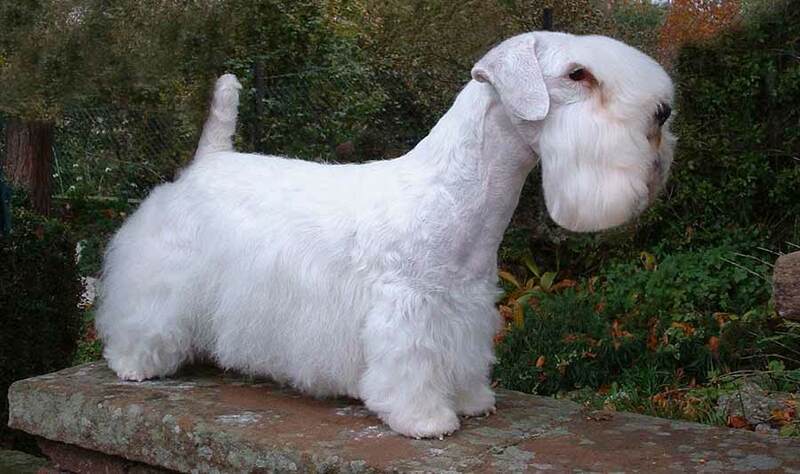 Potential Sealyham Terrier owners should discuss the breed’s grooming needs with a Sealyham Terrier breeder. The Sealyham Terrier is a moderately active terrier. When the Sealyham Terrier plays, she puts her all into it but when not playing, she’s willing to relax and be quiet. This breed enjoys long, brisk walks and a chance to hunt for small animals in the wood pile. Sealyham Terriers also have a sense of humor, and making their owners laugh is one of their joys. This dog is a very good watchdog, with protective instincts and a bark that sounds like it comes from a much larger dog. Because they are so watchful, socialization is very important for Sealyham Terrier puppies. Training this breed can be a challenge. They are bright but can also be stubborn. Owners need to find out what motivates their dog and then use that to build compliance. The Sealyham Terrier dog breed needs an owner with a sense of humor who can laugh at terrier antics. They are patient with children who treat them with respect and do not play too rough. Health concerns include eye problems and allergies. Share your Sealyham Terrier story. Note: Upload only Sealyham Terrier picture or your picture with Sealyham Terrier below - spammer's ip may be blocked.